The best Twitter bios leave a great first impression and help the creator accomplish their goals. 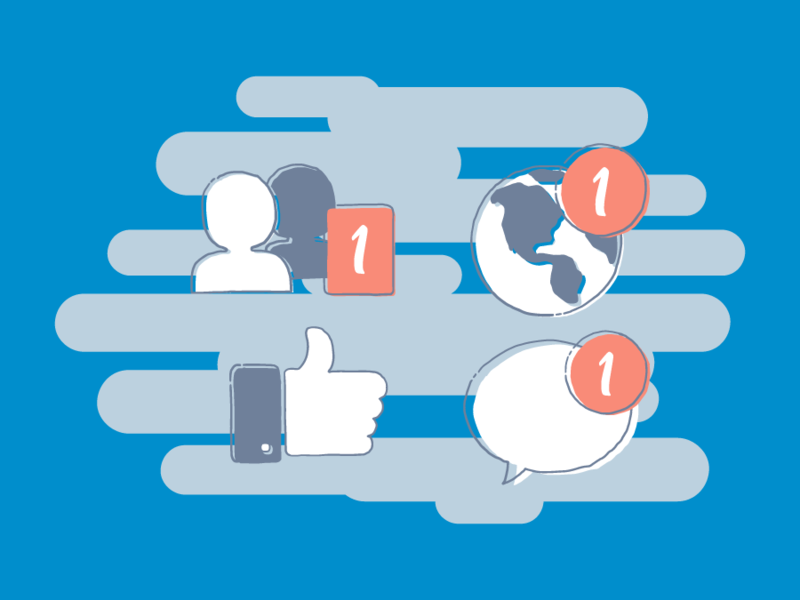 In this post we’ve highlighted the most actionable (yet simple) tips you can use to take your Twitter bio to the next level. You see, your bio can accelerate your growth on social media. The good news is creating an awesome Twitter bio isn’t that hard. You just have to know the right moves to make. When you’re done reading this you’ll have a bunch of great ideas you can use right away. Your Twitter bio is capped at 160 characters. That’s not much, but it’s enough to get your message across. You’d be surprised how many people stop before they even hit 100 characters. The best Twitter bios use every bit of that character real estate. You might feel like you’ve said all you can after 120 characters, but stick with it until it’s maxed out. You could include another call to action, awards you’ve won, anything. It’s really not that hard to fill that space. Trust me, you’ll be happy you did. The whole point of your Twitter bio is to deliver a concise description about who you are. This means you need to mention your personal mission statement in some capacity. You obviously won’t have the necessary space to include the whole thing, so you’ll need to trim it down (significantly). Think of this like an elevator pitch within an elevator pitch. Take your main goal or mission and turn it into one sentence (a short one). This might seem tricky, but it’s actually a great exercise to go through regardless of where you use it. Dropping a link to your company Twitter account within your own bio looks clean, and provides some credibility to your profile. It also does a great job of breaking up the text and making your Twitter bio a lot more readable. Anyone who comes across your Twitter will not only be able to learn about you, but quickly check out any companies you’re associated with. This will help you fast track the relationship building process with potential followers. Social media is a noisy place, so taking advantage of interest when you have it is essential. If your company doesn’t have a Twitter you can always create an account for a side project (if it has the potential to build an audience) or just stick to the rest of the tips on this list. You’ve probably seen a lot of the same phrases and self-anointed titles mentioned in various Twitter bios. The reason people use these is they are trying to set themselves apart from the pack with a little individuality. The reality is it does the exact opposite. If you want to give yourself a funky little title, go for it. Just make sure it’s not being used regularly. To make sure it’s unique, use the Twitter search bar and see if anything comes up. If the results are flooded with similar nicknames it’s time to go back to the drawing board. Including keywords in your Twitter bio is absolutely necessary. This makes it easy for people to find you and provides clarity on what you do. The thing is, most Twitter bios either ignore this completely or go way too far. Work backwards from your core values (step 2) to find keywords ideas to include in your bio. From there, prioritize the one or two that best describe what you do. The best choices should jump out at you right away. If you want to go a little further, do some basic keyword research. This will help you get new ideas and sort them by popularity. If there are any accomplishments you can claim you should include them in your bio. This can be through work or something on the side. Even without anything formal or fancy (“3x New York Times Best Seller”) you can still take advantage of this. For example if you started a blog you can do this. If it’s doing well you could add in something to spice it up (fastest-growing law blog). Interesting accomplishments and projects are left out of Twitter bios way too often. If you’ve done something neat, let everyone know about it! Going too broad is a common mistake people make with their Twitter bios. They want to gain as many new followers as possible and expand their reach on the network, so they talk to everybody. All this does is water down your message. We always recommend that our clients niche things down and get specific on Twitter (even with their bios). You’re better off with 10,000 targeted, engaged, and like minded followers than 1,000,000 who are the opposite. To do this well, write the bio like you’re talking to your ideal customers, clients, or followers. Someone who’s into what you do. Do this and you’ll start off on the right foot with your followers. In an effort to “optimize” their bio you’ll see a lot of people stuff them with hashtags and weird separators. You might even see a lot of the “best” Twitter bio examples do this. Don’t. Instead, keep things clean. You don’t have a ton of space in your bio, but that doesn’t mean you can’t write in coherent English. If you don’t do this you’ll come across like one of those over the top social media people (and maybe even seem a little desperate). You know who we’re talking about, the ones who take LinkedIn SERIOUSLY. It’s a well known fact that your profile picture carries most of the weight when it comes to leaving an impression on social media. This means even if you have the best Twitter bio of all time, a bad profile picture will cancel it out. Trust us, it’s that important. That’s a simplified version, but it will help you avoid the most common mistakes people make with their profile pictures. Pinned posts are a fantastic way to expand on the key points or values you included in your bio. Inside your Twitter bio you should be including the essentials about who you are and what you stand for. But 160 characters doesn’t give you a lot of space to elaborate. This is where you can use your pinned post to expand a bit. We’re not saying you should create a pinned tweet that’s essentially a long description about yourself. That would be kind of weird. What we ARE saying is that you should choose your pinned tweets carefully (and always use one). Don’t just pin any old tweet. Pin one that ties back in with the core values you included in your bio. This could be an accomplishment or news you’re proud of, or an update on something important to you. This will help potential followers learn more about you quickly. If you’re funny, be funny. Of course, when you have something witty to throw in go for it. It can actually help you stand out from the crowd. If nothing is coming to mind however, there’s no shame in settling on a simple, professional Twitter bio. Trying too hard to be funny and failing is a great way to leave a bad impression (or an awkward one). And plenty of people do it. Stick to the fundamentals and you’ll be just fine. Not including a call to action is one of the most common mistakes we see people make with their Twitter bios. You should be using your bio to help promote things you’ve created, done, or are passionate about. The whole point of social media isn’t to jabber at each other all day. It’s to make things happen. It doesn’t matter if we’re talking about a long-term follower or someone who just found you on Twitter, everyone will be looking at your bio. It doesn’t have to be over the top or in your face. Just a quick mention of, “sign up for a free trial here” will do the trick (for example). Everyone knows about including a link in the “website” section of your profile. But did you know that you can include links in your Twitter bio directly? Tons of people don’t (or just don’t take advantage of it). This is a very powerful trick because it can tie in with the call to action tip above. You can link to your main website in your profile, and link to a specific page within your bio. If there’s a landing page you want to drive traffic to, or a link to something neat you’ve done recently, this is a great place to put it. This mean you can link out here and also use a pinned tweet to get as many eyes on your high-priority stuff as possible. This is more of an aesthetic tip than anything else, but appearances matter online. If you’re not using the location area of your Twitter bio you might be shooting yourself in the foot. 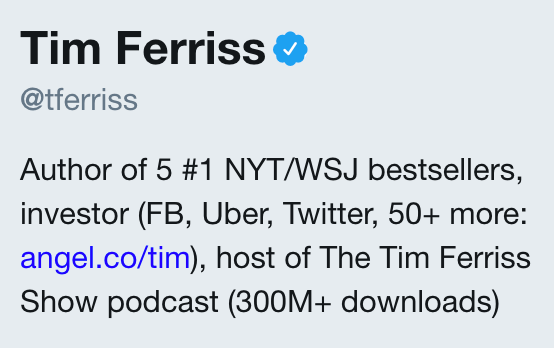 If you look at a lot of the best Twitter bio examples out there, almost all of them are using the location area in some capacity. Leaving this blank makes things look a little less professional or even spammy. Since we know how many fake accounts are out there, users subconsciously put up warning flags when they see parts of a profile not filled out. You’ve gotta put something in there. If you don’t feel comfortable sharing the city you live in online (totally understandable) you can put something else in this area. For example if you look at Buffer’s Twitter account they put “We’re Global” as their location. You can do something similar. This is another aesthetic tip that can go a long way. The collection of images and videos that show underneath your Twitter bio play a big part in the overall appearance of your profile. If you have unimpressive thumbnails and images in this section, it could be harming the effectiveness of the Twitter bio you spent so much time writing. The Twitter thumbnail feature is a little subpar so it’s not always going to look amazing, but you CAN control the quality of what you share. What we recommend doing is going back and pruning some of your recent images and videos (whatever is showing below your bio). Find ones that don’t look great and if there’s no need to keep them anymore, click delete. Here are a few Twitter bio examples that do a great job of utilizing their 160 characters. Use them to get some ideas and inspiration you for your own. 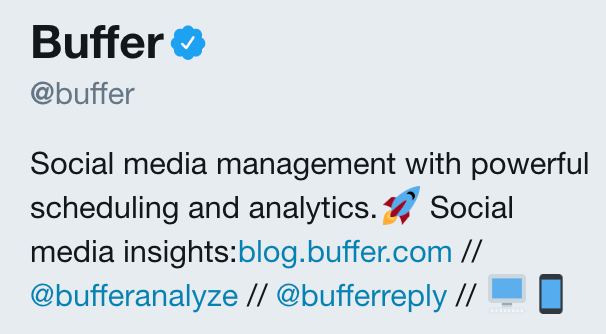 Buffer does a lot right when it comes to social media and their Twitter bio is no exception. They do a fantastic job of describing their business concisely and include some calls to action as well. We also like how they included an emoji to draw in the eye. 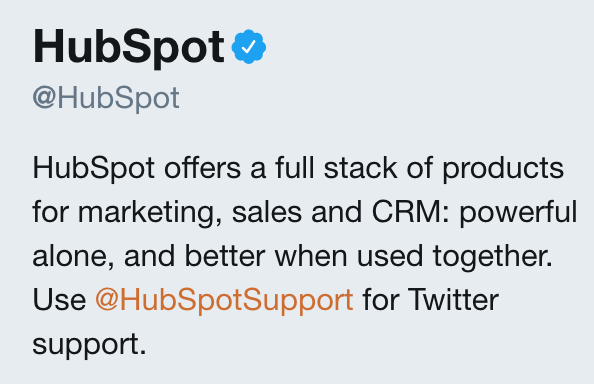 HubSpot makes the list because they effectively include a summary of what they do as well as their motto/slogan. This might seem simple but cleanly pulling it off can be tricky when space is limited. 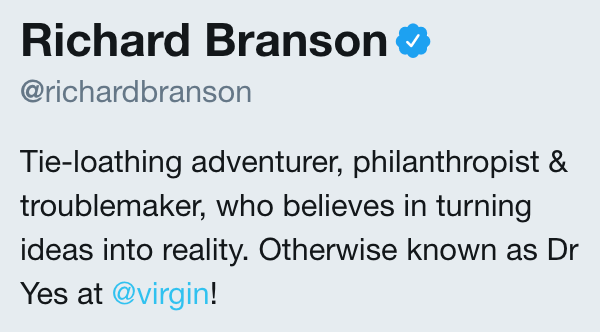 This Twitter bio is fantastic because it delivers Richard’s mission statement with punch without droning on forever. Also the Dr. Yes bit is fun and different. Tim does a great job of hammering home the awards and accomplishments tip that we recommend above. This Twitter bio example lives by that principle and instantly delivers credibility by the truckload. This is a good example of a Twitter bio that has some attitude and uniqueness without being over the top. You get a good idea about what Chamath is like right off the bat and it’s definitely something that fits with his brand. Now you have everything you need to make some big improvements to your Twitter bio. The beauty is, none of this stuff takes long to implement. You can probably knock off most of it in twenty minutes. P.S. If you want to give your personal brand on social media a bit of a nudge, create a free BrandYourself account. 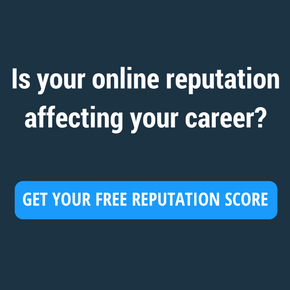 The tool will help you optimize and grow your online presence! Sabrina Clark is the Director of Marketing at BrandYourself.com.